K-Line introduced Bronze Guide-Liners to the market over 20 years ago and is the leader in bringing thin wall bronze liner technology to today’s ever changing market. Focusing on quality, efficiency of installation and most of all durability, they have been working for over 25 years to bring the most advanced technology to the demanding users through their patented Guide-Liner system. With inhouse R & D and dynamometer facilities, K-Line has shown a great deal of commitment to designing and testing its product to meet the ever changing needs of the engine rebuilding market. Their certified manufacturing processes guarantee that you receive K-Line quality for each and every application. K-Liners were originally popularised by those in the trucking industries, where utter dependability and high mileages are their bread and butter. Big rigs can be demanded to run for 250,000 miles and more, time off the road is an expense that the owners cannot afford. 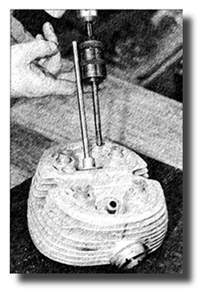 The Cylinder Head Shop was one of the first engineers to use these for classic and racing engines. For many years, smoothbore liners were used by a few specialist race tuning shops in America and we used these until K-Liners brought out their remarkable interrupted scrolled liners. Their Guide-Liners are made of spring tempered phosphor bronze, which is an anti-seizing, anti-wear, high strength-to-weight ratio material. It is more dense than cast iron, has a higher rate of thermal conductivity, a lower coefficient of friction and insures higher lubrication retention due to the interrupted spiral feature of the product engraved on to the inside of the liner. Utilising a patented geometric inner design, lubrication can now be held in the guide, enhancing wear characteristics and reducing the possibility of excessive oil pass through. This patented design feature provides superior installation and fitting characteristics. There is no better system to combine efficiency and durability than the K-Line Bronze Bullet Interrupted Spiral Bronze Guide-Liner System. Combining the durability benefits of phosphor bronze with the efficiency of thin wall installation, K-Line has made valve guide repair a very simple and adaptable operation but does require specialist tooling beyond the budget of repair shops. For kits and training, please contact The Cylinder Head Shop. 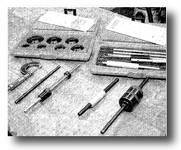 Continued advancements in the tooling and installation process means that we can produce premium quality valve guide repairs, and upgrades, in the most efficient manner. Since the early 1970’s K-Line has run numerous dynamometer tests in conjunction with major production engine builders and O.E.M.’s. Repeatedly the Guide-Liners and has out performed cast iron guides and has become the approved method for rebuilding. In fact, these tests have found the Guide-Liners to be up to three times more durable than cast iron. Further more, the minimisation of both guide lubrication and guide to stem clearances have failed to induce either a seizure or cause metal transfer. Ford, G.M., Caterpillar, Cummins, White Engines, Detroit Diesel-Allison and others have tested the product and confirmed K-Line’s Guide-Liner system as an approved product for use in rebuilding their engines. Our best result was with one customer who, after 50,000 on his BSA A10, still had 2 and a half thou or less clearances valve to guide. Less than they would have been when they left the factory. Standard replacement such as those Norman Hyde sells, guides run at clearances of 2 to 3 thou. Same as the the tolerances on the new 1999 model Harley-Davidsons and others. The standards of early original factory parts can sometimes even be as bad as the parts they are replacing, so it is worth checking that your parts supplier knows what they are selling you. Closer Tolerances Valve to Guide Offer a Number of Benefits to the Owners of Classic, Vintage, High Mileage or Racing Vehicles. Quieter running, increased responsiveness, some racers claim that their engines now tick over for the first time. Greater vacuum created in the inlet port in engines improves all round general performance to the point of requiring re-calibration of the carburetors. Anyone and Everyone can Benefit from K-Liners. At low to mid range cam lift there is a huge vacuum in the inlet port as the engine tries to pull the volume of mixture in the inlet port through a tiny gap between valve and seat, a flow that is improved by a 3 or 5 angle cut. On high revving modern engines, 10,000rpm or more, this is also true of the exhaust port where exhaust gases are escaping along the pipe draw by the gases of the last stroke. The engine under these circumstances is trying to draw air from any available source, including down the side of guide with its inevitable oil mist included. Narrowing the gap reduces this and requires the engine to take gases from where it should be taking them; through the carburettor or out of the chamber. To avoid petrol wash, where too much petrol is drawn through the engine washing away all the lubricant and causing premature wear, it is necessary to lean out the mixture by always reducing the slide size and sometimes the needle jet. With K-Line Guide-Liners fitted, matched to quality new or refaced valves and freshly cut seats, we guarantee owners to return 2 to 3 times the mileage one would expect. One racing head we set up, a championship leader, did 3 seasons without need a head job and still was still in better shape that it would have been straight from the factory at the end of it season. Nothing more than a light lapping with Solvol Autosol was necessary to send it out for its fourth year racing. More recent tests have shown that K-Line’s Bronze-Bullet Interrupted Spiral phosphor-bronze Guide-Liners exhibited 41% less wear than smooth wall liners, as used by other tuning shops, under harsh durability testing environments even at similar tolerances. K-Line manufacture and stock the only complete selection of Guide-Liners and Guide-Liner installation tooling in the World. Due to our many years of successful adoption of this technology, any problems in wear following the fitment of K-Liners or Nucleus Sports Elite Valves can be traced to the lack of carburettor adjustment. 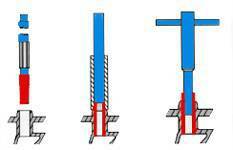 The penultimate combination would be to have Nucleus Power Guides fitted with K-Line Guide-Liners. Bespoke fit, incredible heat transfer and many other individual benefits for differing models. Cast in Guides or Delicate Vintage Head? If guide durability is critical to you, or you own one of many engines than have cast in guides where it is not possible to replace them, K-liner are also the way to go for you. Likewise if you have old, rare or delicate heads where one would wish to avoid knocking out guides from the head casting. Knocking out guides cause erosion in the casting that lead to small oilways being created down between the guides and the head. To avoid this, and it is good practice, fit Guide-Liners. As long as your guides are tight in the head, liners can be fitted. They come in a variety of different sizes. Patented spiral positions the oil where it is needed. The Bronze Bullet Guide-Liner takes K-Line Guide-Line technology to a new dimension by incorporating the proven benefits of phosphor bronze. This design feature allows for efficient installation without requiring any chamfering of the cylinder head. K-Line’s patented process allows us to maintain consistent material thickness through the length of the where it is needed. 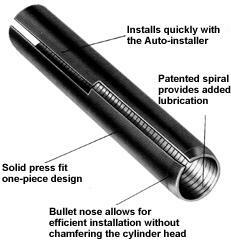 It is inserted so that at final sizing the bullet configuration disappears, providing a consistent internal diameter. It is finished throughout the length of the guide. 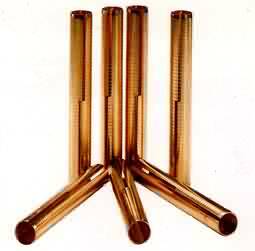 The Bronze Bullet Guide-Liners Costs Less Than Fitting New Guides and Can be Replaced at a Later Date. Dynamometer Test Result Reveal: Interrupted Spiral Guide-Liners Experience 41% Less Wear Than Smooth Wall Bronze Liners. Type of Test: 200 hour durability test. 3% margin of error allowed. Tests were conducted with both smooth wall bronze liners and Interrupted Spiral Guide-Liners using K-Line’s standard installation, and finishing procedures. A Flex-Hone, was also used to finish both parts. The Fitment Process Installation is simplicity itself using special tools and a power drill or preferably an air line. First, the worn guide is bored out using a powered diamond honer aligned by a bush held in the valve seat. Next, the new bore is cleaned out and lubricated before the head is turned over and a liner is hammered home using the installation driver. Excess liner material can then be removed with ahand cutter, also part of the kit With the liner installed, it can now be swaged out to size using either a series of ball broaches and a hammer or an adjustable roller burnisher and a power drill. The roller burnisher has a series of needle roller burnishers near its tip and can be adjusted in increments of tenths of a thou. This tool is expensive but far more accurate and less hassle than the simple, bash-through ball boaches. Once the stem-to-liner clearance is correct, a touch of the topping tool at each end of the guide finishes the job. When the liners are worn out, there is a tool for removing them and new ones can be installed. K-Line Guide-Liners hold infinitely better tolerances than the typical aftermarket valve guides and should last 50,000 miles before they need replacing. We can fit them to tolerances of less than .3 of a thou.